Accountants are responsible for maintaining financial records and ensuring that an organization's bottom line is reflected in the numbers. Because of the crucial role they play in a firm's financial viability, demand for accredited accounting professionals is consistently high, and the job outlook in the field is projected to grow 11% between 2014 and 2024. Most accountants hold at least a bachelor's degree, but due to increased competition in the field, many professionals seek out master's degrees to get an edge in the job market. Graduates can further boost their job prospects with certifications in specific fields of accounting. Becoming a certified public accountant (CPA), for example, can open the door to more job opportunities and higher salaries. Many individuals in this field work as tax accountants, public accountants, or bookkeepers while earning an advanced degree that will lead to high salary careers, such as budget analysts, auditors, or forensic accountants. An increasing number of busy professionals choose to pursue an accounting degree online as a flexible alternative to traditional classroom learning. An accredited online accounting degree covers skills for a variety of professional roles, including budget analysis, risk assessment, regulatory compliance, auditing, tax accounting, and payroll management. While any candidate for an accounting job will have at least an associate degree, a bachelor's degree or higher will increase both salary expectations and employment prospects. An associate degree in accounting provides students with a skillset to pursue entry-level accounting jobs. While it is the lowest level of postsecondary degrees, it is sufficient for a number of professional roles, including bookkeeper, payroll clerk, accounting assistant, billing clerk, and even managerial training. Many professionals work towards an associate accounting degree online, which can be finished in less than two years for an average cost of $13,412.00. A bachelor's online accounting degree typically takes four years to complete and provides graduates with a firm footing for a career in accounting. Professionals who have obtained a bachelor's degree in accounting often work as staff accountants, financial analysts, tax specialists, and even Certified Public Accountants (once they've completed the CPA exam). The average cost for an accredited online accounting degree is $18,435.00. Liberty is located in Lynchburg, Virginia, and the school has one of the most affordable and best online accounting degree programs in the country. As the nation’s largest nonprofit, private university, Liberty provides a Christian education to more than 94,000 online and 15,000 residential students. The bachelor of science in accounting requires students to earn 120 credits. Graduates are prepared for careers in business, education, government, nonprofits, and more. Classes are taught by professionals with real-world experience. The curriculum helps students develop critical thinking and problem solving skills through an emphasis on business communications and computer applications. Online classes are small, with a student-to-teacher ratio of 17:1. Distance students are encouraged to take part in weekly online convocations (gatherings). The Office of Online Student Life, with its list of resources and student groups, offers a vibrant Christian community for distance learners. Ninety-five percent of Liberty’s students receive some form of financial aid. Southern New Hampshire is a private, nonprofit university located in Manchester, New Hampshire, and at regional centers in Portsmouth and Brunswick, Maine. The school offers one of the country’s best online accounting degrees. Students in the 120-credit online accounting bachelor’s program learn about accounting principles, financial analysis, auditing, taxation, business law, and other topics. Students can specialize in forensic accounting and fraud examination, or enroll in the accelerated BS-to-MS program. Southern New Hampshire prides itself on being one of the most affordable and accessible schools of higher education, by allowing constant access to online classrooms and accepting transfer credits from other institutions. SNHU offers tutoring and career services, academic advising, technical support, and a disability resource center to the school’s more than 60,000 online students. SNHU provides financial aid to about 90% of students, and those with a GPA of 2.5 or higher are eligible for grants and scholarships. Indiana Wesleyan was founded in 1920 as Marion College. It’s an evangelical Christian university located in Marion, Indiana, that’s affiliated with the Wesleyan Church. The online accounting bachelor’s degree, offered through the College of Adult and Professional Studies, is a 120-credit program for working adults who have already completed 60 or more undergraduate credits. The program is designed to be completed in about 18 to 20 months. The online bachelor’s degree in accounting program helps students develop competencies in accountancy, taxation, and auditing by addressing theory and practice. Students also take classes in business law, ethics, strategic planning, federal income tax, and more. Online classes are small and taught by academics with professional experience. Indiana Wesleyan’s Off-Campus Library Services can be accessed by phone, fax, email, and mail. Many of the school’s 14,000 students are eligible for loans, scholarships, and grants; the private, nonprofit school distributed $146 million in financial aid in 2013-14. UMass-Amherst, founded in 1863, is ranked 27th (out of more than 700) on U.S. News & World Report’s list of best public, four-year colleges and universities. At the Isenberg School of Management, students studying for a bachelor’s in business administration in accounting take nine courses on topics such as managerial and financial accounting, taxation, audits, financial reporting, and information systems. Learners are required to earn at least 120 credits. Distance learners must fulfill the general education, business, and accounting major requirements. Twenty-one credits in non-business courses are also required. Students are encouraged to explore the Online Resource Center, which operates as a virtual student center, and UGrad, where advisors offer advice and assistance. Graduates are prepared for careers as auditors, tax specialists, bank examiners, financial executives, and more. The school partners with many accounting organization, like the Massachusetts Society of CPAs, Financial Accounting Standards Board, and International Accounting Standards Board. These organizations provide extra learning opportunities for students. Thomas Edison State, located in Trenton, New Jersey, has been meeting the needs of adult learners since 1972. More than 17,000 students from all over the U.S. and 60 countries are enrolled. Students pursuing the 120-credit bachelor of science in business administration degree in accounting study subjects such as federal income taxation; financial, managerial, and cost accounting; and auditing. They also explore business topics like management, economics, business law, and marketing. There’s a special program for students who want to pursue a CPA and a master of science in management. Sixty percent of students who earned an online bachelor’s degree in accounting, in 2016, completed their coursework in three-years or less. Students can earn credits for appropriate work or other life experiences. This public school offers multiple financial aid options, including scholarships. New Jersey residents are eligible for in-state tuition. Florida Tech is located in Melbourne. The school’s 121-credit online bachelor’s degree in accounting has students study subjects such as applied decision making, economics, management, research, law, and information systems. Graduates can enroll in an MBA program in accounting or accounting & finance at Florida Tech. Courses are taught in eight-week terms and have students complete weekly assignments, interact with teachers, and collaborate with peers on discussion boards and chat rooms. Students can access round-the-clock technical support, and there’s a student services representative to help with administrative issues, including an online tutoring service. Florida Tech’s Career Management Services help students with job searches, resumes, interview prep, networking, and workshops. Ninety percent of full-time faculty have the most advanced degree available in their field. Florida Tech is ranked of 82 of 217 in U.S. News & World Report’s list of best online bachelor’s programs. Champlain, a private, nonprofit school in Burlington, Vermont, has been educating students since 1878. Most online courses are offered in seven-week sessions as part of a three-semester academic year, though several accounting classes are presented over 15-weeks. In addition to practical accounting skills, the 120-credit online bachelor’s degree in accounting program emphasizes business and tax law, risk analysis, and problem solving. The curriculum is aligned with the American Institute of Certified Public Accountants Core Competency Framework standards, and Champlain boasts that graduates who take the CPA exam have a “near-perfect” success rate. Online accounting bachelor’s students can access web-based tutoring at any time, and get help with writing from consultants at the Online Writing Center. All students are assigned an academic advisor to help them reach their goals. The Career Collaborative office helps students find a job and internship, prepare for interviews, and improve their resumes. Financial aid is available, and through the truED Alliance program, employees of nearly 60 businesses, government agencies, and nonprofits are eligible for tuition benefits. Regis, a Jesuit Catholic, nonprofit university in Denver, Colorado, was founded in 1877. The school welcomes students—currently more than 9,000—of all faiths. The online bachelor’s degree in accounting program is taught through Regis’ College of Business and Economics. Students are required to earn 128-credits in classes like accounting, economics, statistics, auditing, business law, and marketing. Students learn the most current accounting methods. Graduates are prepared for accounting careers in the public and private sector. Regis’s Learning Commons offers web-based tutoring and writing help. The Ask a Librarian message system is always available. Regis students received more than $134 million in financial aid during the 2015-16 academic year. Graduates preparing for the CPA exam receive a discount on Becker™ CPA Exam Review courses. Regis is ranked 23 of 141 in U.S. News & World Report’s list of Regional Universities West. Saint Leo, located outside of Tampa, Florida, was founded in 1889. It’s the oldest Catholic school of higher education in the state, and has been offering online degrees—including one of the best online accounting degrees—for nearly 20 years. Currently, Saint Leo serves about 6,000 adult distance learners. Students in the online accounting program take 120 credits in accounting, auditing, financial statement analysis, individual federal income taxes, business information systems and analytics, management decision making, business law, and more. The program emphasizes the development of leadership skills. Saint Leo’s active online community includes clubs and associations (including one for accounting students) that provide valuable virtual networking opportunities. Peer mentors guide and support one another. Free online tutoring is available any time, and academic advisors and career services offer support and guidance. Saint Leo is ranked 43 (out of 217) in U.S. News & World Report’s list of Best Online Bachelor’s programs. Keiser, located in Fort Lauderdale, Florida, was founded in 1977. The school has campuses at 18 locations throughout the state. About 20,000 on campus and online students are enrolled. Students take one class at a time; each class lasts four-weeks. The online bachelor’s degree in accounting requires students to earn 120-credits. Learners take courses in accounting, business law, taxation, financial management, decision making, statistics, auditing, accounting information systems, and international financial reporting. The program emphasizes the development of skills in accounting and tax software applications, research and communication, and professional accounting standards. The school’s Online Career Center provides help with resumes, job interview preparation, and provides guidance. Students have received nearly $44 million in financial aid from the university and the Keiser Mills Foundation. Keiser is ranked 23 of 113 in U.S. News & World Report’s list of Regional Colleges South. WGU is a nonprofit, online college based in Salt Lake City. The school emphasizes skills development; accessible, affordable technology-focused programs; and preparing students for professional careers in today’s world. The university’s more than 2,000 full-time and 700 part-time faculty serve over 76,000 adult learners across the country. The accounting degree requires students to earn 121 competency units (similar to credit hours). Learners will study quantitative analysis, finance, business law, and ethics. Students also learn about leadership and management, IT, human resources, and marketing. The web-based learning is enhanced by student learning communities, discussion forums, and student mentors (each student has one). The Ask a Librarian chat service is always available. Western Governor’s fee structure is unusual: tuition consists of a flat rate per six-month term, and remains the same no matter how many courses you take. This makes it one of the most affordable online accounting bachelor’s degree programs available. Terms begin on the first of the month of your choosing. Old Dominion, a public research institution in Norfolk, Virginia, has offered some of the most affordable distance learning programs since the 1980s. In 2016, more than 10,500 online students were enrolled. The online bachelor’s in accounting degree requires students to earn 120 credits. Students should have already obtained about 60 credits. Students learn about accounting, taxation, and information systems. They also take courses in statistics, economics, marketing, operations management, and strategy. Online tools include peer educator and tutoring programs, ePortfolio Student Support, DegreeWorks (a web-based academic advising app), web conferencing apps for study groups (including video archives of web conferences), an online training library, and more. The ePortfolio program helps students successfully navigate the technical and administrative demands of the online educational experience. Career Development Services offer videos, web events, a job board, and other programs. In state residents are eligible for discounted tuition fees. Memphis, founded in 1912 in Tennessee, has a student body of more than 20,000. Undergraduates pursue an online bachelor of business administration degree with a major in accounting through the Fogelman College of Business and Economics, which boasts 97 full-time faculty, 90% of whom have doctorates. Students must earn 120 credits in a combination of general education courses (41 credits), business core classes (42 credits), major requirements (30 credits), and electives (7 hours). Learners enrolled in the online accounting bachelor’s degree program study federal income tax, audits and assurances, and information systems. The school has an Adult and Commuter Student Services office, which offers programs and services for online students, including monthly training sessions, an e-newsletter, the Pinnacle Honor Society, and information about off-campus housing and scholarships. In 2012-13, Memphis students received $219 million in financial aid and scholarships. CC, located in Columbia, Missouri, has been educating students since 1851. It has a covenant with the Disciples of Christ. The school serves more than 29,000 students of all faiths through its 36 nationwide locations and online program, which have been available to working adults and military students since 2000. More than 800 online classes are offered during Columbia’s eight week sessions, which start in January, March, June, August, and October. The 120 credit online bachelor’s in accounting curriculum is one of the most affordable, and is aligned with recommendations from the Association of Collegiate Business Schools and Programs. Classes include financial, managerial, and fund/governmental accounting; auditing, and corporation and federal income tax. The program has general education and business requirements. Online students use the learning management system Desire2Learn to access coursework and interact with peers and instructors. Online tutoring is available. Auburn serves about 25,000 students through its Auburn, Montgomery, and online campuses. Students who have a business degree that’s accredited by the Association to Advance Collegiate Schools of Business can obtain an online bachelor’s degree in accounting in just 30 semester hours, or five-semesters. Students take classes in business practices and internal controls, auditing and assurances, income tax, and information systems. Distance learners can view lectures at any time. Ninety-three percent of Auburn instructors have the most advanced degree available in their field. The school’s Raymond J. Harbert College of Business is home to several centers, including the Small Business Development Center and the Thomas Walter Center for Technology Management. Online students can take advantage of all Auburn offerings, including access to academic advisors, libraries, activities, and events. Alabama residents are eligible for discounted tuition. Bellevue, a private, nonprofit institution located in Bellevue, Nebraska, offers a 127-credit online BS in accounting. Students complete a common business core that includes classes in business policy, ethics and law, financial and managerial accounting, and principles of marketing, management, and finance. Taxation and tax planning courses are also required. There are several options for accounting students, including a specialization in taxes, and the opportunity for students with 90 or more credits to take graduate-level courses. Undergraduates who have completed 60 credits can enroll in an accelerated cohort program, where students progress through courses with the same group of classmates. This program is scheduled over 72-weeks. Undergraduates must complete the school’s Kirkpatrick Signature series, a nine-credit, 12-week series that explores western traditions and philosophies as they relate to the American experience. All students are assigned a student coach/advisor, and everyone has access to free peer tutoring and the school’s writing center. Active military members are eligible for exclusive tuition discounts. Central Methodist, located in Fayette, Missouri, was founded in 1854. CMU currently has about 5,200 students. Online students pursuing one of the most affordable online bachelor’s degrees in accounting must earn 124 credits. Courses include economics, statistics, business ethics, applied computer skills, fraud examination, income tax, information systems, and electives. Instructors deliver lectures through PowerPoint presentations and videos, and students take part in threaded discussions on online forums. Online classes are taught in eight or 16-week terms, and CMU has an eight-member staff devoted entirely to online programming. The school’s library contains about 75,000 titles and multiple electronic resources. Distance learners can access PowerPoint tutorials, subject guides, and all available electronic resources. Grants and loans are available, and Missouri residents are eligible for discounted tuition. Central Methodist also offers a minor and an associate in accounting. St. Joseph’s is a private, Catholic liberal arts college that was founded in 1912. The student body consists of approximately 1,000 students in Standish, Maine. Students in the online bachelor’s degree in accounting program take general education courses, business core requirements, accounting classes, and electives. Learners are required to earn 128 credits. Courses include, financial, cost, and managerial accounting; auditing, economics, business law and ethics, strategic management, and federal income tax. Most courses begin every month. Online students are assigned an academic advisor, who helps them map out their degree path. The Fast Track program allows students who receive at least a “B” in select courses to waive several classes as they pursue a master of science in accountancy. This allows a quicker path to being eligible for the CPA exam. A banking major and accounting minor are also available. Interested in exploring one of the South’s best online accounting degrees? At UAB’s Collat School of Business, students take classes in financial, cost, and international accounting, and income tax, auditing, and management and information systems. Ninety-percent of faculty hold Ph.Ds. Online programs at Alabama-Birmingham are well established: U.S. News & World Report ranks the school 86 of 217 on its list of Best Online Bachelor’s Programs. There’s also a dedicated Online Academic Advisory Council and website (UAB Online) for distance learners. Online students can access 24/7 technical help, plus networking opportunities and preparation assistance for professional exams, including the CPA. UAB online accountancy students can participate in the business school’s 17 business student organizations, and qualifying students may join Alpha Sigma Lambda, the honor society for adult learners. Loans, grants, and scholarships make this program one of the most affordable options for online learners. Temple is located in Philadelphia. Students pursuing an online bachelor of business administration with a major in accounting attend the Fox School of Business, which in 2015 had 1,103 undergraduate accounting students. Students learn about transactional and cost analysis, accounting information systems, taxation, auditing, and professional and business ethics. This online bachelor’s degree in accounting involves scheduled live sessions, which are accessed in the evening; Most work can be done on your own time. Students can record and replay materials. These real-time virtual meetings encourage a truly collaborative and authentic classroom experience. Online students have access to tutoring, writing support, the Math and Science Resource Center, instructional videos, and the Fox School of Business Center for Student Professional Development. The Fox Center provides virtual coaching and resume and interview guidance. Temple is ranked 48 on U.S. News & World Report’s list of best college business programs. NU, founded as the Northwood Institute in the late 1950s, is a nonprofit university that has prepared more than 35,000 graduates for business careers. Northwood has a residential campus in Midland, Michigan, and regional educational centers in Michigan, Kentucky, Texas, Louisiana, and California. Students need to accumulate 123 credits to earn an online bachelor’s degree in accounting. Courses include economics, financial management, business law, taxation, managerial and cost accounting, auditing, ethics, and general education subjects. Northwood students start taking accounting classes during their first semester; courses on business management also form an important part of the curriculum. Almost all of the faculty (97%) have advanced degrees. Northwood’s Career Advancement Center has a career network for job seekers, and helps students prepare for interviews. The school’s library services include an always-available Ask a Librarian chat service and 35 online databases. Davenport was founded in 1866 in Grand Rapids, Michigan, and has been offering bachelor’s and master’s degrees since the 1980’s and 90s. Davenport has campuses throughout the state and an established online presence: approximately 3,300 (42%) of Davenport learners complete their coursework online. Online bachelor’s degrees in accounting students in the college of business take 120 credits, which are split between general education, business, required, and elective accountancy classes. Courses include federal, payroll, and state taxes; fraud examination, auditing and assurances, information systems, and more. Students can take a four-class, 12-credit specialization in internal auditing or management accounting. The school’s Career Service office provides job search, resume, and interview help; information about internship opportunities and assessment and research services. Students can reach librarians through chat or text, and there are video tutorials, course and writing guides, study resources, and online tutoring. This private, nonprofit university has locations in the northwest and a robust online presence: More than 30% of City University’s nearly 6,400 students complete their studies entirely online. Another 20% are enrolled in a combination of online and in-person classes. Programs are geared towards working adults. Students can earn a 180-credit online bachelor of science in business administration with an emphasis on accounting in three-years. Students must complete general education, business, and accounting requirements, studying everything from federal income tax and management accounting to operations and marketing. The school operates on a quarter-term system. The Career Center regularly offers webinars for job seekers, and City University is ranked 27 of 217 on U.S. News & World Report’s list of Best Online Bachelor’s Programs. There are need and merit-based scholarships, and scholarship opportunities for transfer students, veterans, and members of ethnic minorities. Every student is assigned an Academic Success Coach and has access to the SC Writing Center, which provides virtual consultations through Skype and answers questions through email. On average, financial aid applicants receive close to $8,000 a year in aid. Students in the military (and their spouses) receive tuition discounts. Southwestern also offers scholarships for adult learners. This Gainesville, Georgia, school was founded in 1878 and began serving adult learners in the 1970s. Brenau currently has about 3,500 students on its Georgia and Jacksonville, Florida, campuses, including online. Brenau has been offering online classes since 1998; 29% of its students are online learners. The bachelor of business administration with a major in accounting is a 120-credit program. It consists of a liberal arts education and business classes, and courses in taxation, auditing and assurance services, and fraud examination. Students with a 3.0 or higher GPA who are planning to take the CPA exam can continue their education with Brenau’s master of accounting or MBA in public accounting program. Classes are seven-weeks long. Online classes are limited to 20 students. U.S. News & World Report ranks Brenau 52 of 146 on its list of Regional Universities South. A master's degree in accounting ensures a higher level of speciality in the field, and can equip candidates for careers in corporate accounting, financial analysis, tax examination, and even business management. Professionals with a master's degree in accounting typically pursue CPA (Certified Public Accountant) or CMA (Certified Management Accountant) licenses. Online accounting degrees are available at the master's level and can be completed in less than two years. The average cost for a master's online accounting degree is $19,748. The University of North Carolina at Chapel Hill offers an online master of arts in accounting (MAC) degree program through the Kenan-Flagler Business School. The MAC program can be completed in just 15 months. Courses are delivered live via webcam with an integrated messaging system to facilitate student participation. Students who have already earned an MBA can complete the program faster through an accelerated 37-credit hour curriculum. Distance learners who have already taken a significant number of accounting courses as undergraduates can benefit from a personalized curriculum with waivers for courses already taken and an opportunity to take courses in other areas of business. These students can graduate with fewer than the standard 45-hour criteria. Students in the online program have the option to join the students in the on campus program to attend leadership and interview immersion activities. More than 98% of the program’s graduates are employed within three months of graduation. The University of Texas at Dallas offers an online master of science in accounting degree program through the Naveen Jindal School of Management (JSOM), an internationally recognized school of business. The online program, also known as the "MS Accounting Flex" program, requires students to complete a broad, project-based 36-credit curriculum. Distance learners can take all classes online and graduate in 18-25 months. Students can tailor their degrees to their specific career goals by incorporating electives from a variety of fields, including corporate accounting, international accounting, internal audit, government and not-for-profit accounting, and taxation. Coursework prepares students to sit for the Uniform CPA Examination after they complete their online accounting master's degree; students must meet the requirements of their state’s board of public accountancy to be eligible. Online students have access to the same resources as their on-campus peers, including academic advising, financial aid, tutoring, and access to online library resources. Students in the MS Accounting Flex program are eligible for JSOM merit-based scholarships. Rutgers University-Newark in New Jersey offers a 30-credit master of accountancy in governmental accounting entirely online. The part-time, 10-course program includes seven required classes and three electives and can be completed in just one year. The master's in accounting online program satisfies the 150-hour requirement for the Uniform Certified Public Accountant Exam and is suitable preparation for students interested in government financial management, accounting, and auditing. The program's core competencies include governmental accounting knowledge, ethical judgment, critical thinking skills, and persuasive communication. Applicants are not required to submit GMAT scores, and all students pay in-state tuition. Start dates are available in the fall and spring semesters. The University of Connecticut, located in Storrs, Connecticut, offers an online, master of science in accounting (MSA) degree program. All MSA courses can be taken online, with the exception of the mandatory four-day in-residence course. The curriculum is primarily asynchronous and requires students to complete two required courses and eight accounting electives, allowing students to tailor the academic experience to suit their interests and needs. Students choose from 14 accounting elective course offerings, including courses in forensic accounting and fraud examination, enterprise risk management, financial reporting and auditing implications relating to income taxes, and accounting and auditing for governmental entities. The university is recognized for best practices in online learning by the U.S. Distance Learning Association. 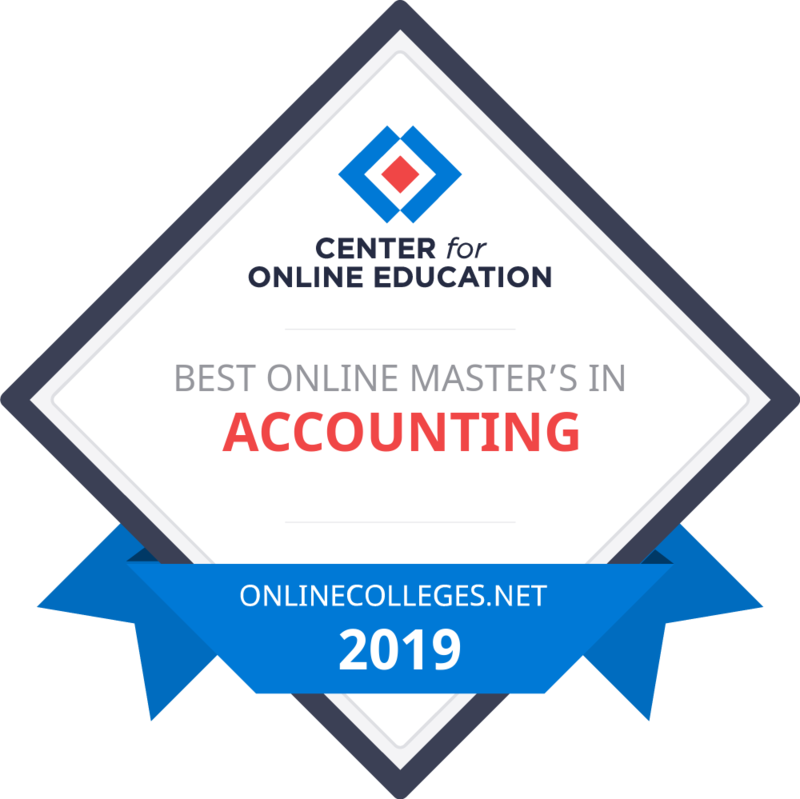 The online master's in accounting program allows qualified students to meet the 150-hour educational requirement to sit for the CPA exam in most states. Mississippi College, located in Clinton, Mississippi, is a Christian university offering an online master of business administration in accounting in addition to on-site and hybrid programs. Students can complete the program in two years. The curriculum emphasizes critical thinking, collaboration, and understanding business from a global perspective. The MBA in accounting is offered through Mississippi College's School of Business, which is the college's largest school. The online MBA in accounting gives students a solid foundation in accounting information systems, taxation, and auditing. It also provides training in financial, management, and government accounting. While the GMAT is required for admission to the program, the college's MBA prerequisites have been reduced from 24 to nine hours. Nova Southeastern University, located in Fort Lauderdale, Florida, offers an online master of accounting (M.Acc.) degree program that can be completed online in 21 months. The master's in accounting online curriculum meets all of the CPA requirements and prepares students to take the CPA exam. The program is offered through NSU's Huizenga College of Business. It is designed to help students enter or advance careers as a professional accountant in public practice, government, industry, financial institutions, and nonprofit organizations. While the program is designed to meet the needs of working accounting professionals, students with limited experience in accounting can complete foundation course requirements online. Admissions to the master's program is competitive. The GMAT is required for some candidates. Three start dates are available throughout the year. NSU offers a number of dual degree programs, including the dual law/accounting degree program in which students earn both a J.D. and M.Acc. George Mason University, located in Fairfax, Virginia, offers a part-time master of science in accounting (MSA) online degree program that can be completed within a cohort in two years. Online courses in the program are primarily asynchronous and are offered on a quarterly schedule, allowing students to complete two courses every 10 weeks. Interactive courses encourage participation through email, discussion boards, blogs, wikis, and social media. The George Mason online master's in accounting program helps students meet the 150-credit CPA licensing requirement. All requirements can be completed online with the exception of a mandatory one-week global residency abroad. The international study tour is led by an MSA professor, and previous tours included Prague, Frankfurt, and London. Mason MSA graduates, on average, earn a starting salary of $10,738 more than those with only a bachelor's degree in accounting. Nearly 86% of George Mason's MSA graduates have a position related to their career goals upon graduation, and nearly 66% receive signing bonuses. The University of Alabama at Birmingham offers a master of accounting online degree program through its Collat School of Business. The 30-credit online master's in accounting program helps students expand and reinforce their skills in leadership, business, mathematics, communication, and analytics as well as prepare to sit for the CPA exam. The program can be completed in five semesters and was designed by Collat School faculty members who are leaders in their field and consult for the Big Four accounting firms and Fortune 500 companies. Scholarships are available to those who qualify. The program was designed for accounting professionals, though prospective students without a bachelor's degree in accounting or business can participate in the 24-credit master's in accounting bridge program. The University of Massachusetts-Amherst offers a 30-credit master of science in accounting (MSA) online degree program through its Isenberg School of Management. The online master's in accounting program is designed for students with an undergraduate degree in accounting. The coursework includes seven required core classes and three electives. The MSA can be completed in eight months. There are three start dates throughout the year. Students prepare to take the CPA exam through a curriculum designed specifically by and for accountants. All New England states and New York recognize that the MSA program fulfills the criteria for CPA licensure. Online students have the same access to the vast student resources available to their on-campus peers, including academic advising and access to online library materials. Liberty University, located in Lynchburg, Virginia, has pioneered distance learning since 1985. Today, through its School of Business, Liberty offers a 30-credit master of science in accounting online degree program that can be completed in one or two years. The school identifies itself as a "Christ-centered school of business." The core curriculum is 21 hours and includes seven courses. Students are also required to take three electives, totaling nine hours. Elective courses focus on topics such as organizational behavior, strategic learning and management, entrepreneurship, strategic marketing management, effective executive communication, managerial finance, and international business. The master's in accounting online program allows students to develop written and oral competencies in their area of focus while studying modern research approaches in accounting, taxation, and auditing. Students will also become familiar with international accounting practices and the importance of ethics in accounting. Students enrolled in Liberty University's online learning programs have access to an online library, writing resources, IT support, and study aids. Golden Gate University-San Francisco offers a master of accountancy degree online, designed to prepare students for careers as certified public accountants and certified management accountants. The program is designed to meet the needs of both accounting professionals and those interested in making a career change. The self-paced online accounting master's degree program can be completed in two to four years, and students can begin the program during any term. Depending on the student's background, up to 12 proficiency courses in math, economics, and finance may be required in addition to the 45 units of graduate coursework required for the degree. The 45 units include 33 units of core courses and 12 units in a concentration area. Concentration options include a general concentration, forensic accounting, and taxation. Students in the online program are invited to the campus to take part in the Accounting Career Fair in late September. This professional development opportunity allows students to network with top firms. Suffolk University in Boston, Massachusetts, offers a master of business administration online degree program with an accounting focus through its Sawyer Business School. Students can enroll in the online program as a part-time or full-time student. The 49-credit program includes 12 credits of electives. Students can use these credits to complete a concentration in accounting by completing three or four of 15 approved accounting courses. Online students are required to participate in a three-credit travel seminar to enhance their connection with faculty, classmates, and business leaders. Students spend seven to 10 days immersed in global business in a foreign country. Students choose from various destination options including Germany, India, Brazil, China, England, and Greece. Students in the online program have the opportunity to engage with peers and faculty through each course's required synchronous chat session. The University of Massachusetts-Lowell offers a 30-credit master of science in accounting online degree program. The university's business school offers the master's in accounting online program through the Division of Online and Continuing Education. The 10-course MSA program is designed for accounting professionals who wish to advance to higher-level accounting positions in corporate, nonprofit, or governmental organizations. Students with undergraduate degrees in majors other than accounting are required to take seven undergraduate courses to meet the prerequisites for the MSA program. Students complete the program at their own pace, taking one or more classes per term. The program provides students the opportunity to study in-depth topics such as globalization, forensic accounting, governmental and nonprofit accounting, corporate finance, and advanced auditing. Applications are accepted year-round. Courses start in the fall, spring, or summer terms. Located in Utica, New York, SUNY Polytechnic Institute offers a 33-credit master of science in accountancy online degree program. The 11-course online master's in accounting program can be completed on a part-time or full-time basis through SUNY Poly's Department of Business. The SUNY Poly MSA online program was developed to help students qualify to sit for professional accounting examinations for CPA and CMA credentials. The accounting core courses include 15-credits in financial statement analysis and reporting, advanced income tax research, fund accounting, advanced auditing theory, and advanced financial accounting theory. Students must complete five business core courses and one elective. Applicants with no accounting background can take six prerequisite courses at the undergraduate level in order to enter the MSA program. Auburn University in Alabama offers a master of accountancy degree program that can be completed primarily through online courses. The program requires students to attend a two-day on-campus residency to participate in the Auburn MAcc Leadership Summit. The summit features social events, business seminars, and leadership workshops. Students can complete the program in two years while continuing to work full-time. Students who take a heavier courseload can complete the program in one year. The online master's in accounting program curriculum provides technical, research, and communication skills while preparing them to pass the Uniform CPA exam. Auburn's Harbert College of Business utilizes smart classrooms in which campus classes are recorded and streamed online for distance learners to view live or when their schedules allow. This ensures distance learners receive the same lectures as their on-campus counterparts, while online discussion boards facilitate participation and interaction among peers and professors. Wilmington University, located in New Castle, Delaware, offers a 30-credit master of science in accounting. The online master's in accounting degree program was designed in response to CPA licensure requirements recently enacted in Delaware as well as to meet the expanding need for accountants and financial managers with credentials. The program provides a foundation for students interested in sitting for the Certified Management Accountant Exam and the Certified Fraud Examination Exam. Designed for individuals who want to make strong contributions to their profession while advancing their careers, students can complete the program's required 10 asynchronous courses at their own pace. The core curriculum consists of eight courses and includes topics such as auditing and assurance services, fraud prevention, forensic accounting, federal taxation, and international accounting and taxation. Students are required to take two electives. Friends University in Wichita, Kansas, offers a 36-credit professional master of business administration online degree program with a concentration in accounting. Students complete the online master's in accounting program through three-credit courses that are eight weeks long each. Through the program's prior learning assessment, students have the opportunity to reduce the requirements by at least two foundations courses. The program's format allows students to earn their professional MBA degree in three to four semesters while working full time. Coursework is designed to enhance students' analytical abilities, deepen their knowledge of networking, and widen their perspective on problem solving and business. Courses are led by talented faculty and established business leaders. In this interactive online program, students will participate in case studies, simulations, and individual and collaborative projects. Friends University does not require the GRE or GMAT for admission, but graduate programs require a pre-admission interview with the program director. National University, located in La Jolla, California, offers a 14-course online master of accountancy degree program through its School of Business and Management. Students must complete 63-quarter-units in order to graduate from the MAcc program. The core curriculum includes courses that take an in-depth look at accounting information systems, taxation of individuals and businesses, auditing principles and procedures, and advanced managerial and financial accounting. The online master's in accounting program is designed to suit the needs of students without previous accounting experience and without a bachelor's degree in accounting. The curriculum is based on content specifications of the Uniform CPA Exam. Emporia State, located in Kansas, offers a 30-credit master of accountancy online degree program. The online master's in accounting program is designed for working professionals and consists of 10 courses. All ESU online courses are delivered through the Canvas online learning portal. Students will meet the 150 hour requirement to sit for the CPA exam in Kansas and other states. The MAcc degree prepares students for professional accounting careers in government, management, and public accounting. Emporia State University students enrolled in distance learning programs have access to a number of student services. These services include advising, writing centers, mathematics computer labs, academic assistance (tutoring, test prep, disability services), financial aid, and library services. ESU distance learning students can also take advantage of career services, career counseling, and professional development opportunities. Located in Statesboro, Georgia Southern University offers a 30-credit master of accountancy online degree program. Made up of 10 three-credit courses, the online master's in accounting degree allows working professionals to complete the online program in two years. Students take two courses each fall and spring and one course each summer for six consecutive semesters. Because the program is team-based, students complete each of the six core classes as a cohort. These courses cover topics including financial accounting systems, accounting information, tax research, fraudulent financial reporting, auditing, and current legal issues. Students must also take four electives. The average GMAT score of admitted students is 520. GMAT waivers may be granted based on extensive managerial experience and/or outstanding academic background. Admissions are made on a rolling basis. The University of Scranton is one of just 28 Jesuit colleges and universities in the United States. Located in Pennsylvania, the university offers a 30-credit master of accountancy online degree program that can be completed in two years. Students can take courses at an accelerated pace with approval of their advisor, completing the program on a full-time basis in 10 months. Throughout the academic year, the University of Scranton accepts and reviews applications on a continuous basis. The online programs at the university offer six eight-week terms per year, and there are several start dates throughout the year. The online master's in accounting is an interactive program delivered via the Engage Learning Management System. Students interact with each other and their professors through email, threaded discussions in online forums, instant messaging, and virtual chat sessions. Located in Gainesville, Georgia, Brenau University offers a master of business administration in accounting online degree program. The 15-course online master's in accounting program is 45-credits and leads to an MBA and a certificate in one of two accounting concentrations: public accounting or management accounting. Students who plan on taking the Certified Public Accountant (CPA) exam and enter a public accounting practice should opt for the Public Accounting concentration. This concentration prepares students for careers in auditing, taxation, client consulting, and forensic accounting. In addition to the CPA, other credentials related to the public accounting concentration are Chartered Accountant, Certified Internal Auditor, and Certified Fraud Examiner. Students who intend on practicing in the area of management accounting as chief financial officer, accounting manager, or controller should opt for the Management Accounting concentration. Certified Management Accountant and Chartered Global Management Accountant are credentials related to this concentration. Indiana Wesleyan University-Marion, an evangelical Christian comprehensive university of The Wesleyan Church, offers a master of science in accounting (MSA) online degree program. Designed to maximize the learning experience for working adults, the 30-credit online accounting master's degree program can be completed in 18-26 months. The curriculum includes 10 three-hour accounting-focused courses in topics such as critical thinking and business communications, ethics and law, corporate taxation, information systems, and forensic accounting and fraud examination. Students progress through the program with their peers as a cohort. Online students have access to student resources, including an extensive collection of books, journals, and databases via IWU's Off-Campus Library Services. The master's in accounting online program, offered through Indiana Wesleyan University's DeVoe School of Business, has five start dates throughout the year. Stetson University, located in DeLand, Florida, offers a 30-credit master of accountancy online degree program designed for working professionals. The online accounting master's degree program is offered through the M. E. Rinker Sr. Institute of Tax and Accountancy. The 10-course M.Acc. curriculum can be completed in one year with no residency requirements. Each course is conducted over five-week periods, and students progress through the program with a cohort of about 25 of their peers. In addition to equipping students with knowledge and practical skills necessary to be a successful professional accountant, the program also helps prepare students for the Certified Public Accountant Exam. It meets the 150 hour-credit criteria that many states require for CPA licensure. Stetson University's business school applicants. Graduates are accepted on a rolling basis. Edgewood College, located in Madison, Wisconsin, offers a 30-credit master of science in accountancy online degree program. Full-time students can complete the program in one year, while part-time students can complete the program in two to three years. Coursework will prepare students for accounting careers in the private, public, or not-for-profit sector. The online master's in accounting program curriculum incorporates and emphasizes topics surrounding innovation, international business, and social responsibility. Program requirements are divided into two sections: business and accounting. Business courses focus on business law and ethics as well as executive communications. The accounting course requirements include a capstone in strategic financial management. The School of Business at Edgewood College offers three start dates throughout the year. Edgewood College holds accreditation through the Higher Learning Commission of the North Central Association of Colleges and Schools. A doctorate in accounting is the terminal degree for the field. Doctorate degree-holders stand out among their peers as exceptionally skilled finance and accounting experts. A doctorate online accounting degree is also an ideal objective for professionals wishing to teach or enter the world of academia. These programs are usually completed in four years. A management accountant is a high-level position in a business or professional organization, responsible for overseeing and managing a wide range of financial activities. They are expected to monitor spending, explain financial outlooks, cut unnecessary expenses, and even formulate growth strategies. Because management accountants are expected to fill a variety of roles, they are usually equipped with several licenses, certifications, and online accounting degrees. Many will be Certified Public Accountants (CPA) and have a Master of Business Administration (MBA) degree. Some earn their accounting degree online while working. A Certified Public Accountant (CPA) is an accredited title given to professionals who have completed the Uniform Certified Public Accountant Examination. This authorizes accounting professionals to prepare, evaluate, and consent to the viability of financial statements. CPAs are also certified for the process of auditing clients' financial statements. Many accountants strive to become CPAs to improve their employment prospects and diversify their skillsets. They are usually required to complete a five-year degree program, which may be obtained through an online accounting degree. Financial analysts provide insight on matters related to investment activity. They assess the performance of stocks, bonds, acquisitions, and other ventures, and offer financial guidance to managers and executives. They may work independently on a contract basis, or as salaried employees of a large corporation. Financial analysts are usually required to be certified by the Financial Industry Regulatory Authority (FINRA) to work with securities, although many employers will sponsor the licensing process. Online accounting degrees help working financial analysts advance their professional standing and salary expectations. Accounting clerks typically specialize in one area of the accounting department, such as billing, payroll, or compliance. Successful accounting clerks will have at least a bachelor's, master's, or other accredited online accounting degree. While the growth rate for accounting clerks is expected to decline in coming years, many in this job position set their sights on a more general professional accounting role, such as a bookkeeper. Billing clerks create and send invoices to clients and customers. They are also expected to calculate and keep records of any data related to billing and invoicing. Billing clerks are not always required to have an accounting degree, but a higher degree typically results in a higher salary. The Uniform Certified Public Accountant Examination (CPA Exam) is taken by accounting professionals who wish to become certified public accountants in the U.S. CPA-certified workers are equipped with a range of accounting skills, including technical know-how, commitment to procedure, analytical skills, and communications. The exam is divided into four sections: business law and professional responsibilities; auditing; accounting and reporting (taxation, managerial, and governmental and nonprofit organizations); and financial accounting and reporting (business enterprises). Some states require CPAs to maintain and improve their skills through continuing education and professional development courses. The Certified Management Accountant is taken by professionals who are seeking accreditation for financial and accounting management skills. Those who are qualified to sit the exam have experience in financial planning, business decisions, analytics, and control. The exam itself emphasizes financial planning, analysis, control, and decision support. CMA candidates must complete a number of educational and professional experiences, including a bachelor's degree, two years of continuous professional/workplace experience, and 30 hours of Continuing Professional Education (CPE) credits. The Certified Professional Auditor (CIA) is the professional designation administered by the Institute of Internal Auditors (IIA), and is taken by accountants who plan to specialize in the field of internal auditing. CIAs are required to take continuing education courses to maintain their IIA certification. The Certified Fraud Examiner (CFE) Exam is taken by accounting professionals looking to specialize in the field of fraud prevention, detection, and investigation. It is administered by the Association of Certified Fraud Examiners. CFEs demonstrate a wide professional skillset relating to fraud, including deterrence, scheming, investigation, and law. Those wishing to take the CFE Exam must be ACFE members and have approved CFE Exam applications on file. Enrolled Agents (EA) are federally licensed tax practitioners who are authorized to represent taxpayers at the Internal Revenue Service (IRS). EAs advise, represent, and prepare tax returns for individuals and organizations. Enrolled Agents must pass the Enrolled Agent Exam, which assesses the candidate's knowledge of all areas of U.S. tax code, or they must have worked at the IRS for at least five years in a position heavily involved in tax code application and regulation. To renew their license, EAs must complete 72 continuing education (CE) credit hours over the three-year renewal period. Certified Government Financial Managers (CGFM) are accounting professionals who have been accredited by the Association of Government Accountants (AGA). These professionals have experience in government accounting and financial management. CGFMs must pass three examinations: Governmental Environment, Governmental Accounting, Financial Reporting and Budgeting, and Governmental Financial Management and Control. To maintain their certification, CGFMs must renew annually and complete 80 continuing professional education credits every two years. Certified Financial Planners (CFP) are granted their certifications by the Certified Financial Planner Board of Standards. Those who pass demonstrate for employers that they are equipped to practice as independent financial planners. To maintain their certification, CFPs must complete 30 credit hours of continuing education every two years. This process also involves a renewal application and fee.